Blacklion Golf Club is a beautiful 9 hole parkland course established in 1962, with coppices of woodland and mature trees. 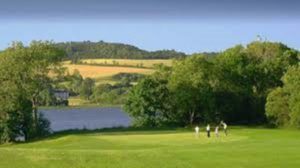 The lake comes into play on four holes and there are some magnificent views of Lake MacNean, islands and surrounding hills. It has been described as one of the best maintained nine-hole courses in Ireland, and one of the most scenic. Facilities include a clubhouse with trolley hire, chipping/putting practice area, changing rooms, snooker table, and a licensed bar serving hot food and light refreshments.